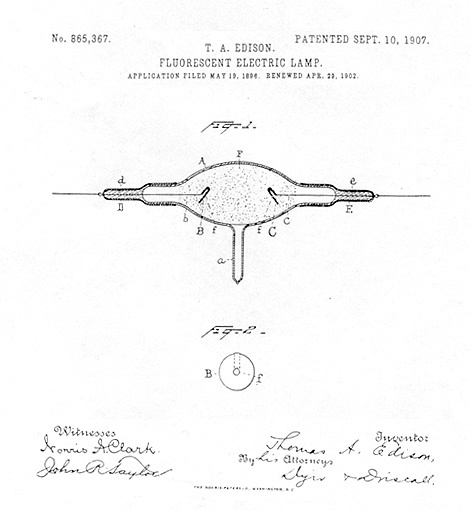 One of Thomas Edison's lesser known patents is this one, granted on 10 September 1907, for a fluorescent lamp. 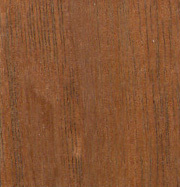 The application was initially filed on 19 May 1896 and renewed in 1902. There is no evidence that these lamps were ever offered for sale. Which is probably just as well. Unlike fluorescent lamps common today, Edison's lamps did not use ultraviolet radiation from mercury vapor to excite the phosphor. His lamp used x-rays. In late 1895 Wilhelm Roentgen of Germany discovered this radiation, and a fascinated Edison immediately began experimenting with it. By May of 1896, after a fast series of experiments, Edison had developed a medical fluoroscope. By placing a calcium tungstate coating on the outside of the fluoroscope's clear x-ray tube, he developed the lamp in figure 1 above. The two electrodes in the lamp are platinum discs, seen end-on in figure 2. Edison did not experiment long with x-rays. The death of assistant Clarence Dally at the West Orange lab from an x-ray overdose, and the difficulty of making reliable x-ray tubes cooled Edison's fervor and he turned to other projects.